“Summer is a state of mind”, goes the saying, and when you think of summer your mind fills with images of beaches, breeze, brightness, relaxation and of course, fun! Summer means vacations in most parts of the world, and even if you aren’t travelling anywhere, there’s this feeling of freedom and release in the air. So to help you make the most of this season, we have here the ultimate list of summer activities, featuring crafts, printables and more – enough to keep you busy all summer long! 1. When you’re at the beach, you have access to water, which means its time to go boating! Try making this cute Bottle Boat from Molly Moo Crafts, using old shampoo bottles. 2. Enjoyed your time at the beach? Then let the kids make this Paper Plate Sea Shell Craft from Artsy Craftsy mom to relive the fun times they had by the sea! 3. Whether you go swimming at the beach or just play by the shore, a swimmer’s mask is fun to make! 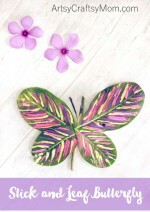 Try this paper plate craft from Pink Stripey Socks that’ll make you feel like putting on some goggles and diving in! 4. No beach party is complete without a beach ball game! This simple paper plate beach ball craft from Glued to My Crafts is easy and ideal for the younger set. 5. Surf’s up! Take your little mini figures or action figurines surfing at the beach with these realistic-looking toy surfboards. Full tutorial at Play Trains. 6. When you’re at the beach, take care to not get bitten by a crab, but that doesn’t mean you can’t have a pet crab! Make these cute shell crabs from Yesterday on Tuesday with basic craft supplies. 7. Having a beach party? Decorate in style with this beach dinnerware craft from Hands on As we Grow. 8. If you have a collection of small shells, this adorable handprint sand clay craft from The Imagination Tree is perfect to make! P.S. Makes a great souvenir for grandparents! 9. Create your own beach at home with some beach themed painted rocks! Get inspiration from the images at Just Imagine. 10. It’s not just crabs that live at the beach, you’re likely to find some starfish too! Make this simple puffy paint starfish craft from I Heart Crafty Things to recreate your time at the beach! 11. I scream for ice cream in summer, and so does everyone! Give your room a summer makeover with a cute ice cream garland from Hello Wonderful. 12. Catch up on your summer reading with a colorful ice cream bookmark from Artsy Craftsy Mom – decorate it with sprinkles of your choice! 13. Go double scoop with this cupcake liner ice cream craft from I Heart Crafty Things with toppings of your choice! All you need are cupcake liners and basic craft stuff. 14. If you like your ice creams soft and fluffy, you’ll love this pom pom ice cream craft from The Darice Craft Blog. This requires a little skill, so it’s better suited to older kids. 15. Summer’s the perfect time for messy crafts, like this Paper Mache Ice Cream Sundae craft from the Art Bar Blog! Spread out lots of paper and let the kids get crafting! 16. Popsicles are popular during summer for their juiciness, but also for their colors! Brighten up your summer with this giant paper popsicles from Craft Whack. 17. Be warned; this puffy paint ice cream craft from Crafty Morning looks so much like the real thing you’ll be tempted to lick it off the paper! 18. Summer holidays are the perfect time to set up a make-believe ice cream shop. Once you’re done, get ready to sell these yummy looking pretend play ice cream cones from Hello Wonderful. 19. Tired of all the itsy bitsy ice creams? Then make this giant ice cream cone craft from Make and Takes that’ll make for an impressive piece of room decor. 20. Summer is a time for getting together with old friends and cousins and playing fun games – like this Catch the Ice Cream Game with Artsy Craftsy Mom. 21. Choose the prettiest shells among the ones you collected at the beach and turn them into this lovely glitter shell necklace! Find out how to make it at The Chirping Moms. 22. Don’t throw away those Popsicle sticks after eating the ice cream – use them to make these Popsicle stick bracelets from Molly Moo! Recommended for older kids to avoid breaking the sticks. 23. Got too much candy and don’t really want to t it all? You don’t have to, not when you can make fun jelly bean jewelry as shown by Marla Meridith. 24. It’s vacation time, the perfect occasion for some over-sized jewelry like this rainbow pom pom necklace from This Heart of Mine. You can of course, make it smaller, but we like it big! 25. How would you like to wear your art? With this fun upcycled foil necklace craft from Fantastic Fun and Learning, you can wear your own customized work of art! 26. Sprinkles make plain cupcakes look prettier, and they can also make boring jewelry more interesting! Try this DIY sprinkle bangle upcycle from ehow and you’ll have a new meaning for the term ‘arm candy’! 27. You don’t have to be an Origami expert to make these seriously impressive folded paper bracelets from Pickle Bums. This is another great way to wear your heart on your sleeve; I mean art on your cuff! 28. Pipe cleaners are incredibly versatile, as shown in these absolutely gorgeous pipe cleaner finger rings featured on Sweet from the Heart. They’ll be all the rage this season! 29. Hardware can also be used in pretty projects, like these washer necklaces from Small for Big! Your tween will love having jewelry that matches her nail color! 30. Got leftover pasta that expired in the meantime? Use them to make these super-cute macaroni cat necklaces from PBS; you can also use colored straws if you haven’t got any old pasta. 31. Have a bright and colorful ladybug family in your room by making these cute ladybug rocks from Parenting. Try them out in different colors and googly eyes of different sizes for a fun assortment! 32. If you’re going on a nature walk, be sure to pick up some twigs and leaves to make this beautiful stick and leaf butterfly nature craft from Artsy Craftsy Mom. 33. Bugs are fun, especially for little kids, but playing with bug fossils is another thing altogether! Enjoy and learn with this Playdough Bug fossil project from No Time for Flash Cards. 34. 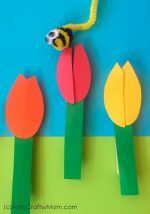 Wake up sunny and smiling every day with this happy looking toilet paper roll bee craft from Easy Peasy and Fun. How can you look at that face and not be in a good mood? 35. Think snails are slimy? Think again! This button snail craft from I Heart Arts n Crafts is a great use of recycled CDs and colorful buttons. 36. Spring cleaning aside, summer is a great time for recycling, and these bottle cap bugs from This Grandma is Fun are such a cute way to recycle bottle caps! 37. Dragon flies are pretty elusive, but not these clothespin dragon flies from Crafty Morning! 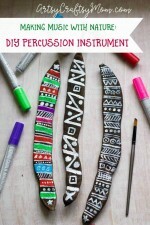 With just clothespins, pipe cleaners and googly eyes, you’re all set! 38. Summer is when you have lots of sun, so why not ‘catch’ it with some easy fire fly sun catchers? Try this Eric Carle inspired craft from I Heart Arts n Crafts. 39. Who says spiders have to be black and creepy? They can also be bright and colorful, like these pool noodle spiders from Molly Moo crafts! 40. Enjoy the true serenity of a relaxed summer day with this rainbow caterpillar button craft from Artsy Craftsy Mom, set against a grassy hill and bright blue sky. 41. You don’t really need a season to have Nutella, but when they’re in the form of these Nutella Cool Whip Popsicles from Big Bears Wife, they become an instant summer favorite! 42. Your kids will wake up extra early to have these Milk and Cereal Breakfast Popsicles from Katrina’s Kitchen, and there’ll be no need of any more lectures about the importance of breakfast! 43. Kids won’t be able to resist the bright colors of these Mango Strawberry popsicles from Tasty Kitchen; and they won’t even complain about the fruit! 44. Who needs all those artificially colored popsicles in stores when you can have your own naturally colored whole fruit popsicles? Get the full recipe from The View from Great Island. 45. It’s unlikely that you’ll want to eat a real banana split after having these gorgeous looking Banana Split Pudding Pops from The Kitchen McCabe. 46. Got a bunch of kids coming over and don’t have too much time to make something? Try these Rainbow popsicles from Sandy Toes & Popsicles, made using the convenience of instant mix packs. 47. Three classic kid favorites come together in these Chocolate Peanut Butter Banana Popsicles from Architecture of a Mom, making them a must-make! 48.Who on earth would imagine that a cheesecake could be turned into a popsicle? That’s exactly what they’ve done at Damn Delicious with their Strawberry Cheesecake popsicles. 49. A pudding in the form of a popsicle – can’t say no to that! These funfetti pudding popsicles from Rachel Cooks have hidden sprinkles, that are a pleasant surprise! 50. Get the ultimate refreshment this summer with these sunny Pineapple orange banana popsicles from Gimme Some Oven – a flavor combination that is synonymous with loose shirts and wide brimmed hats! 51. Sidewalk chalk gains renewed popularity during summers, and these Sidewalk chalk Pops make drawing even more fun! Check out the full tutorial at Project Nursery. 52. Kids on the couch all day? Hand them these Balloon Boppers from Crafting in the Rain and let them hop, skip and jump as they enjoy some fresh air! 53. Walking on your feet is all well and good, but how about trying to walk on stilts? Make these tin can stilts from Frog Prince Paperie – in just 15 minutes! 54. Summer evenings are great for firefly spotting, but even if you can’t find real ones, you can make your own! Apartment Therapy has an awesome firefly craft that really lights up in the dark! 55. Whenever there’s a light breeze this summer, be sure to run outside with these giant paper pinwheels! Get the printable template and full tutorial at Kids Activities Blog. 56. Having an outdoor night party this summer? Set the scene with these awesome glowing mason jars featured at From Panka with Love. 57. Who doesn’t love blowing bubbles? Make this simple activity more exciting with these bubble snake creatures from Two Daloo. 58. The summer breeze is great to refresh you on a hot day but it’s also great for something else – kites! Make these adorable mini kites from One Creative Mommy and watch your kids fly with the wind! 59. Even if you don’t want to go out and fly kites, you can sit indoors and listen to the sweet sound of the wind as it breezes through this toddler-friendly beaded wind chime from Rainy Day Mum. 60. Give the poor birds some respite on a hot day with these recycled tin can bird feeders from Birds and Blooms. Be sure to do the painting outside too! 61. On a hot day, a hand fan can come in very handy, especially outdoors. Make it more refreshing with this DIY Fruit Fan craft from A Girl and a Glue Gun. 62. There’s something instantly summery about sliced fruit, and these Paper Plate Fruit Slices from Crafts by Amanda are perfect for the season! They also work well as learning aids for preschoolers. 63. Want some pretend fruit to play with this summer? Try making these Pom Pom Fruit from Mr. Printables – they’re easier than they look! 64. Nothing spells vacation like relaxing in the shade, a book in one hand and a glass of lemonade in the other – even if it’s made of paper! Try making this Paper Lemonade Craft from Pitter Patter Art – uses lots of techniques! 65. Go tropical with a bright pineapple craft that makes use of paper plates and handprints – great for even toddlers to try out! 66. Fruit printing is pretty popular but you can also print fruit using other objects, like this wine cork cherry craft from Crafty Morning. 67. Strawberries needn’t be reserved to Valentine’s Day, they’re just as right for summer! This heart strawberry craft from Housing a Forest is really easy for the little ones. 68. Citrus fruits are eternally popular during summer, so why not decorate your room with it? Try this easy folded hanging citrus fruit paper craft from Buggy and Buddy. 69. Want a fruit craft that also doubles up as a gift? Try these insanely easy Kiwi fruit coasters craft from Oh Happy Day, with free printable. 70. Mr. Printables has some adorable play fruit printables that are seriously impressive and perfect for summer! 71. The first thing you pack when going camping is obviously, the tent! Create cute little Popsicle stick tents as shown in Glued to My Crafts, complete with an entry flap and camp fire! 72. What’s camping without a camp fire? And while you’re at it, you might as well make one that glows, like this Glowing camp fire craft from Buggy and Buddy! 73. Once the fire is ready, it’s time to roast marshmallows! Alternately, you could make a marshmallow shooters craft as shown in Coffee Cups and Crayons. 74. Enjoy your time around the camp fire with some craft stick harmonicas from Make It Love It, followed by some scary stories! 75. Set up your own mini camping site for your small dolls or action figures with this step by step tutorial from Artsy Craftsy Mom. 76. A camping trip will have bugs, for which you need a bug catcher! Make your own bug catcher with recycled glass jars with inspiration from this craft from Oriental Trading. 77. Don’t miss out on sights near and far, with these very realistic cardboard tube binoculars from Crafts by Amanda. 78. You’ll be on foot for a while, so make things easy by using a walking stick, made prettier with washi tape. Get the tutorial at One Charming Party. 79. Keep yourself entertained by making a nature themed tic tac toe game with rocks, as shown in Organize your Stuff Now. 80. Rubbing two stones can yield fire, but can rubbing two hands? Well in the case of this hand print camp fire craft from Glued to My Crafts, it looks it’ll work! 81. Summer nights are great for lying outside and looking at the stars. Turn this into a learning opportunity with these star gazing flashlights that teach about common constellations in the sky. 82. Learn all about how parachutes work with this extremely simple but effective coffee filter pipe cleaner parachute guy craft from STL Motherhood. 83. The perfect time to make a sun dial is when the sun’s out in full force, a.k.a. summer! Make a simple sundial with a paper plate and pencil, as shown in Paging Super Mom. 84. It’s summer, the perfect time for messy, outdoor experiments, like this bottle rocket from Frugal Fun 4 Boys. Beware, it goes really high! 85. It’s blazing, so make use of the full power of the sun’s energy to power your own solar windmill, as shown in Artsy Craftsy Mom. 86. What will you do with frozen hands? Learn a valuable chemistry lesson of course! Check out the salt and ice activity at Happy Hooligans that features frozen hands. 87. Be awed at the beautiful patterns created in this basic kaleidoscope craft and marvel at the play of light and colors! Full tutorial at Buggy and Buddy. 88. There are many ways to learn about density, but this one with ice cream sauce is a summer style density experiment! Get the details at Science Sparks. 89. Even if you’ve had fun at the beach, it’s still interesting to make your own aqua sand as shown in Growing a Jeweled Rose. 90. Science was never this pretty! 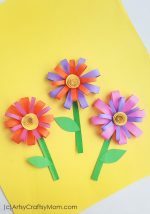 Try out this color changing flowers experiment from Go Science Girls and be amazed! 91. Whether you’ve been to the beach this summer or not, this Beach I Spy Game Printable from The Pleasantest Thing will offer several hours of play! 92. Get the kids off the couch and increase their flexibility with garden yoga. Get the full printable with directions from Yoga for Kids. 93. Get this summer printable pack from Artsy Craftsy Mom – packed with coloring pages, numbers, letters, pattern matching and some sheets for scissor practice. 94. Let the kids’ imagination run wild this summer! Make your own comic book with a free comic book template from Kids Activities Blog. 95. Chill in the summer heat by coloring in ice creams of all flavors with these coloring page printables from Kids Activities Blog. 96. Don’t let the entire summer go to waste! Schedule specific activities each day with this summer schedule printable from Somewhat Simple. 97. Make your child’s summer reading more interesting by downloading the summer reading bingo printable from The Chirping Moms. 98. The summer night sky is perfect for star gazing, and this free printable summer star gazing chart from All Free Paper Crafts will help you locate the constellations correctly. 99. Let the kids sharpen their memory this vacation, by playing this Memory Matching Game from Live Laugh Rowe. 100. It’s vacation time, which means time to bond with the whole family! Get together with this free printable Bingo game pack from Artsy Craftsy Mom that includes 6 Bingo boards and a set of cards. Now you should have something for everyone in the family to do, regardless of age or gender! So restock your craft supplies, spread out some newspaper and get ready to have a rocking, fun-filled summer! What fantastic ideas…. One of our favourite summer activities is chicldrens face painting. We love it, it’s always around during the summer at most outdoor events but we love doing it at home as well. 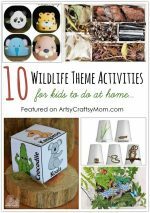 This is really helpful tips, I was thinking of what activities I am going to do for my kids now you gave me this bright ideas. thanks a lot.